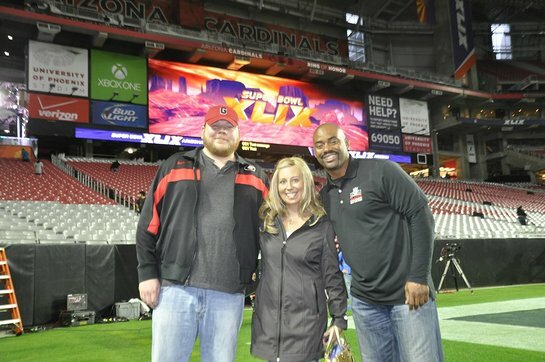 November is Lung Cancer Awareness Month and former NFL linebacker and international health care advocate, Chris Draft, kicked it off by launching Team Draft’s fourth annual Lung Cancer Survivors’ Super Bowl Challenge. This unique challenge gives lung cancer survivors the opportunity to compete to raise funds for public awareness and research in their communities. The top four fundraisers will join Team Draft at the Super Bowl, Pro Bowl, College Football National Championship Game, or Taste Of The NFL. Founded by Draft and his wife Keasha who died of lung cancer in 2011, Team Draft is dedicated to raising lung cancer awareness and research funding through its Campaign To Change The Face Of Lung Cancer, the centerpiece of which is the Super Bowl Challenge. Draft explains, “the Super Bowl Challenge gives us a unique opportunity to use the overwhelming media coverage surrounding the Super Bowl to raise lung cancer awareness on an international level.” Those efforts are paying off. “The Challenge achieves some amazing things in terms of public awareness and changing perceptions about lung cancer,” says Dr. Ross Camidge, Director of Thoracic Oncology at Colorado University Cancer Center. The Challenge also raises funds for lung cancer organizations and treatment centers in local communities across North America. Survivors raising more than $1,000 may commit 50% of the funds to a lung cancer organization or local cancer center while survivors raising more than $5,000 may commit 80% of those funds to their chosen organization. “Anybody can get lung cancer. The disease doesn’t care where you live, but your zip code often determines the quality of care you receive,” explains Draft. “In football, we understand the importance of the home field advantage. By allowing survivors to direct where funds go, we’re giving people the opportunity to fight for better cancer treatment in their communities — to give themselves and their neighbors the home field advantage,” he says. To learn more about the 2018 Lung Cancer Survivors’ Super Bowl Challenge, sign up, or support a survivor, click here. Fundraising is open now and ends January 1, 2018 at 3:00 am EST/12:00 am PST.